Create a Windows Forms application and embed Unigine into it. Initialize Direct3D11 by using SlimDX library. The sample can be run on Windows only. Install Microsoft Visual Studio for C# (Visual C# Express). It can be downloaded for free. Microsoft Visual Studio Community 2013 supports multiple languages and C# by default. Read more about the Visual Studio Community 2013 IDE. Install Microsoft Windows SDK 7.x (can be downloaded for free). 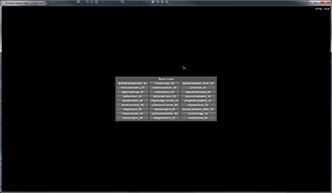 Install DirectX redistributive June 2010 (can be downloaded for free). Install Python 2.7 (can be downloaded for free). Install SCons 2.0+ (can be downloaded for free). Microsoft .NET Framework 4 or higher is required. SlimDX library will be installed automatically when you install UNIGINE SDK. Open the Visual C# main_x86.csproj (or main_x64.csproj) project file located in the <UnigineSDK>/source/csharp/samples/App/D3D11SlimAppForm/ folder. Click the button on the toolbar (or DEBUG -> Start Debugging) to start the project. Windows Form Application will open. AppForm - inherits the Unigine.App class. In this class thedoUpdate(), doRender() anddoSwap() functions are overridden and call the update(), render() andswap() functions respectively. AppFormControl - inherits the System.Windows.Forms.Form class. This class implements all the necessary events, which will be performed when user interacts with the application. D3D11SlimAppForm - inherits the AppForm class and initializes the graphics Direct3D11 API in the Windows Forms Application via the SlimDX library. UnigineApp - defines the entry point of the program. C# Wrapper and Engine are initialized here. AppForm, AppFormControl, D3D11SlimAppForm are defined in the Unigine namespace. 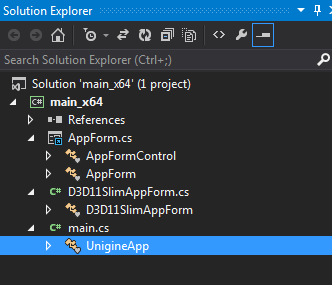 Article on App Class to learn how to create an application based on the Unigine.App class.